Meat and animal fat is not bad for you. 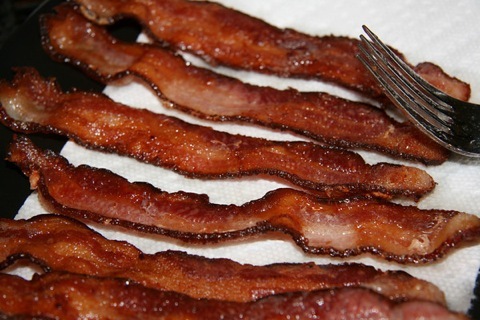 People have been eating bacon long before McDonald's and Twinkies were around. You actually need animal fats. It's all the processes foods and oils that are bad for you. Sugar, modern GMO wheat, processed vegetable oils. Do some homework. I bet your grandparents ate plenty of bacon and other meats, and stayed away from a lot of the whites. BTW, it's not the bacon or the eggs that are bad for you. It's the Toast and the cereal that were both made with processed, bleached flour that had whatever small amout of nutrients processed away. there's a reason they have to fortify it when they make your bread and other processed foods. Last edited by Shawn; 08-25-2013 at 09:08 PM. It is better than Klingon Gagh served live! The Food Pyramid you were taught in school, much like any of the the government's nutritional guidelines, have absolutely nothing to do with your health. It's all about consumption/$$$. Still it is taught like it IS Gospel truth. What about Wonder Bread it was claimed to build your body? The Whiter the bread, the faster your DEAD. Some nitrates, however, are naturally occurring, such as celery juice and sea salt, which can also be used to cure some meats, including bacon. What does make sense is “Fresh Air Pork” or pork that is fed an all-natural vegetarian diet, made up of the sorts of nuts and berries that hogs forage for in the wild. Like free-range chicken or pasture-raised cows, happy pigs make tasty bacon. There was an Organic restaurant in Fort Lauderdale which my friends owned, and they are Weston Price members. They would make me sweet potato french fries, topped with kimchee, and smothered in bacon grease. Yummy.